If you are planning a voyage with your family or friends this vacation, then call us for getting the best deals. At Global Andaman Tour & Travels, we are engaged in offering reliable cruise services across Port Blair (Andaman and Nicobar Island, India). Our cruise agents are associated with some of the leading cruise companies across Port Blair. 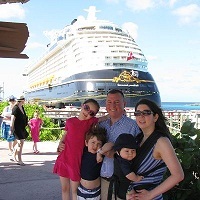 Therefore, they can help you in getting reservations in the best cruise. We ensure that the cruise ship is equipped with modern amenities and offers various facilities such as a large dining area, swimming pool, accommodation, etc.